Triple your luck with this handcrafted trio of brass wishbones. Grant three wishes with one dreamy pendant. 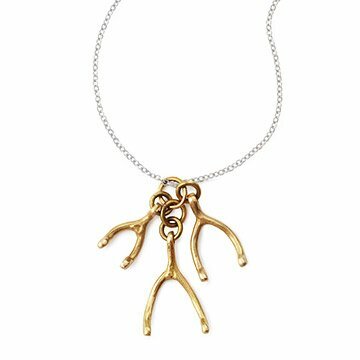 Kristina Kada's handcrafted trio of brass wishbones dangle from a sterling silver chain, providing the wearer with triple the luck and a reminder to follow her heart's desires. Handmade in California. Kristina Kada draws inspiration from the world around her. Using traditional techniques like lost-wax casting, stamping, forging, and fabrication from sheet and wire, she creates a cohesive collection of work. While pursuing a degree in metalsmithing and jewelry fabrication, she was able to explore myriad manufacturing techniques. During the summers, she studied under many masters of the jewelry world. All of Kristina's pieces are hand-fabricated and assembled at her studio on the Santa Cruz coast. Here, surrounded by the ocean, rugged coastline, and giant Redwood trees, her jewelry line is brought to life.